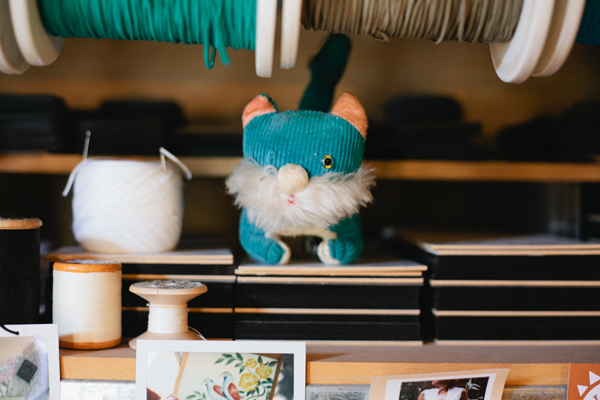 FK talks to Katrina & Farley from Adelaide based accessories label Kitty Came Home about their creative space. All photos featured in this post with special thanks to our Adelaide photographers White Wall Photography. 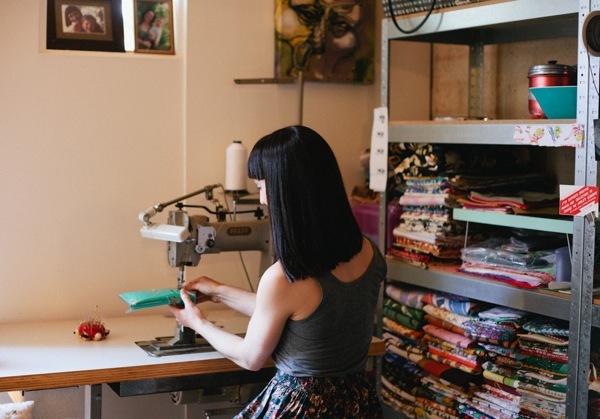 Tell us a little about your range and what kind of things you create in your own space? 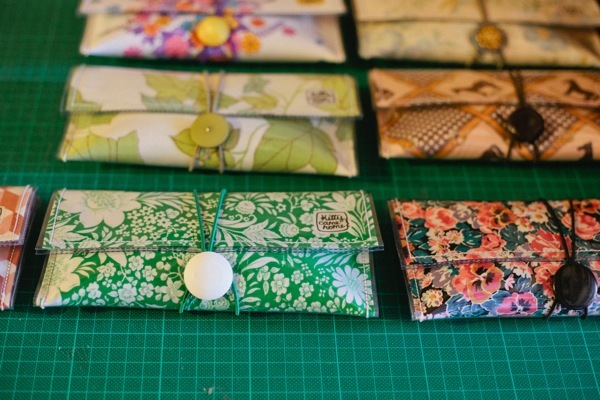 Kitty Came Home designs and handmakes a range of vintage fabric accessories: a button clutch and its big sister, the super clutch; diary and journal covers; wallets; and nana-knitted woollen brooches. Kitty also designs and handmakes a range of sterling silver jewellery. 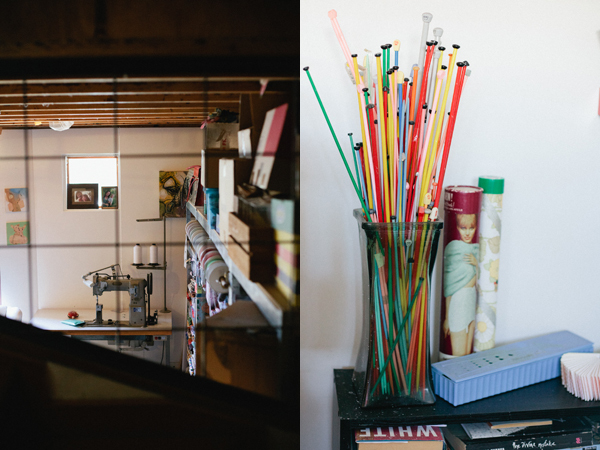 What is your work space like and what things do you like to surround you when you work? 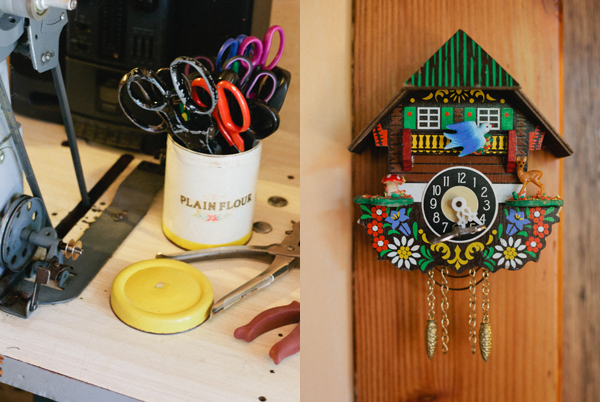 Our workspace is also our home, so we’re surrounded by a mixture of nurturing domesticity, colourful fabrics, and all the creative paraphernalia of sewing and silver-smithing. I like being able to move easily between being online, polishing silver, cutting fabric and baking cake. Best of all: it means Fella (the cat) is always available for love and cuddles. 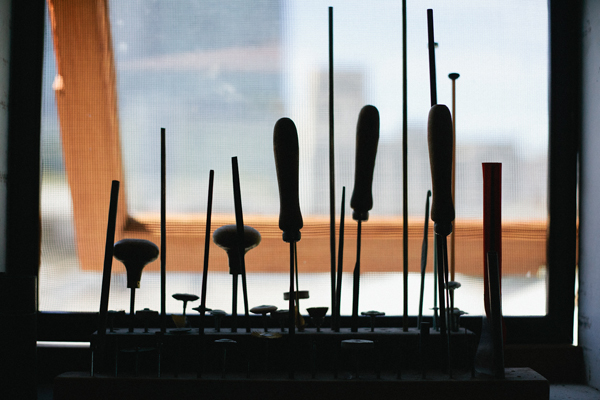 What are some ‘tools of your trade’ that are essential for you to work with? 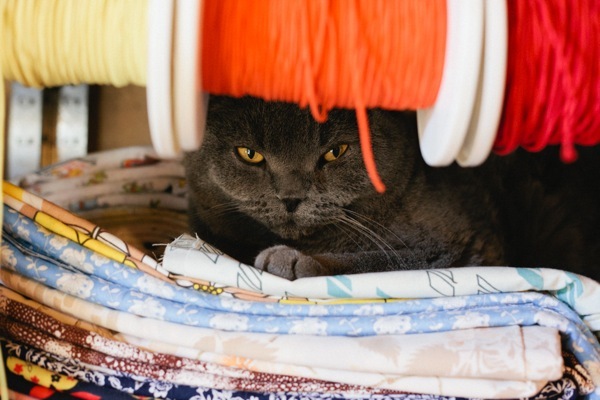 We’ve currently got two industrial sewing machines – they’re the engine for sewing the vintage fabric accessories – and a lint roller is absolutely essential for ensuring there’s no kitty-fur on any of the fabric. 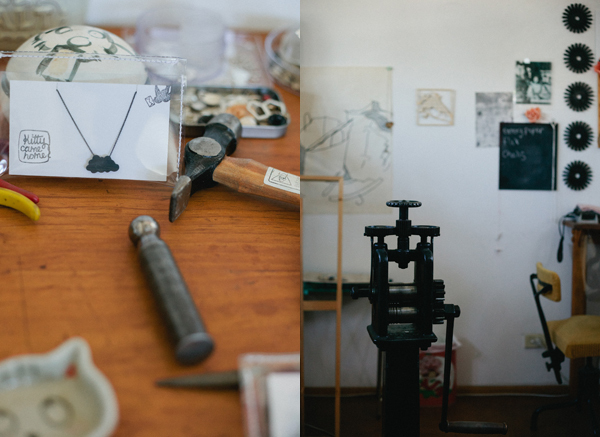 The rolling mill in the jewellery studio is both useful and inspiring; its size and weight adds some earthy gravitas to all the fine-detail jewellery handtools: the various files, drill-bits and saw-blades. What keeps you motivated and inspired when you’re working? A new piece of fabric is always inspiring; or cups of tea and a chat; and tuning into Radio National keep us stimulated throughout the workday. Where do you go for inspiration for your home & work space? We’re always looking to balance function and pleasing aesthetics. The architecture here provides lots of nooks and angles with which to work – small spaces that necessitate functional minimalism, as in having to constantly clean out excess and think outside the square. What does a typical day for you involve when you are working? Breakfast time often includes some online time checking emails and shop orders, followed by mapping out the day. 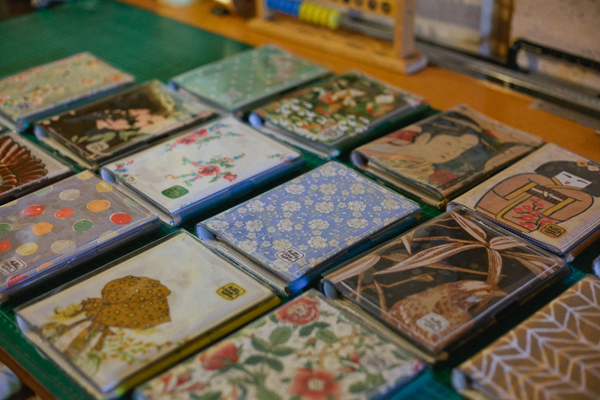 And then we’re off to iron fabric, match buttons and stitch clutches; fill, pack and post orders; or upstairs to the jewellery studio to cut out and solder and finish item, or photograph the outcomes for sales sheets or the online shop. 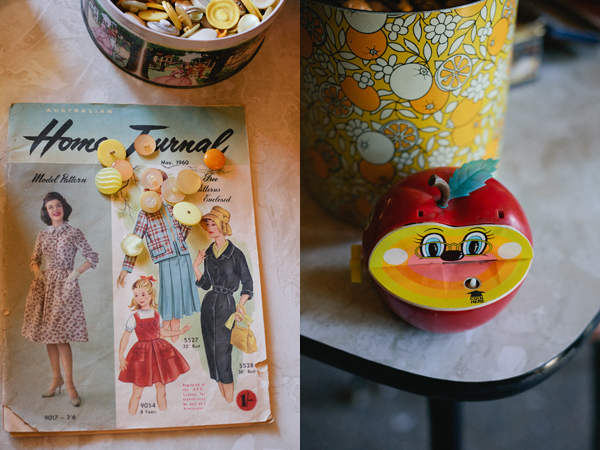 Errands to pick up materials usually include an op-shop visit or two for more fabric and buttons. What do you love about your surrounding area? 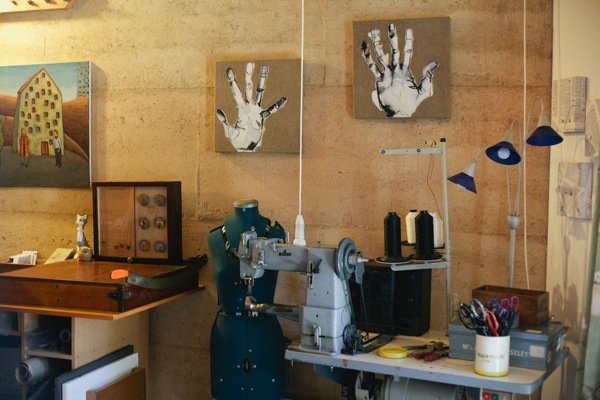 Kitty’s home/studio is part of an artist housing cooperative in the centre of Adelaide. The small cluster of properties (rammed earth walls, polished concrete floors, galvanised-iron exteriors) nestle intimately together providing like-minded community and friendly-faces near to hand. We’re encircled by parklands for recuperative walks; and we’re only 200 metres from the Adelaide Central Markets, enabling an easy lunchtime escape to Lucia’s Cafe, and access to lots of deliciously fresh fruit and vegetables. Being within walking distance to several of our retail outlets is a bonus, and curry nights on the balcony of the Exeter Hotel (Rundle Street) are, well, let’s just say the awesome staff there know we’re always up for a bottle of their good house red. 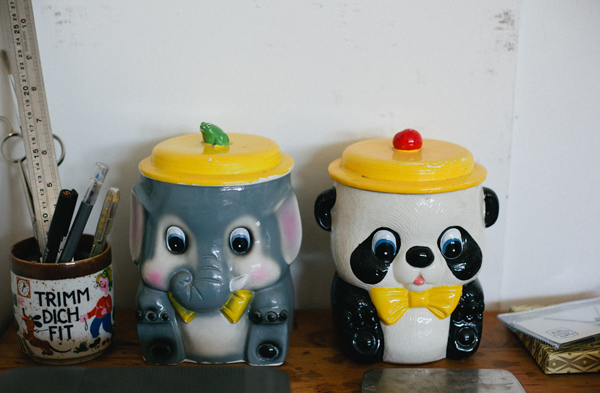 What things would you love to add to your creative working environment? 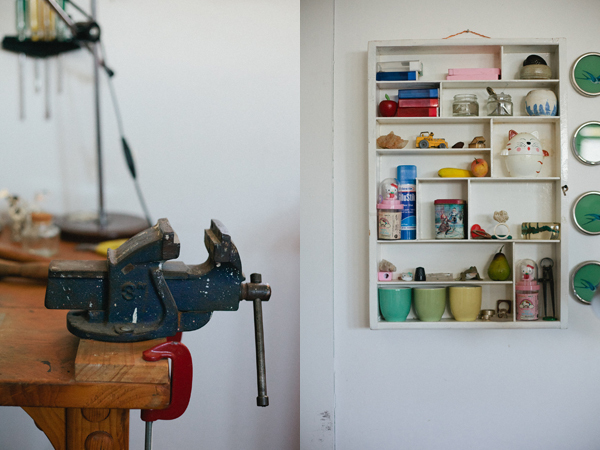 We’ve just done a major tidy of the jewellery studio so now there’s space for a second jewellery bench, and we’re currently hunting for a third specialist sewing machine. All the wonderful photos featured in this post are by White Wall Photography and are exclusively for the Finders Keepers! This looks like such a relaxing and creative hub! Take me there immediately! 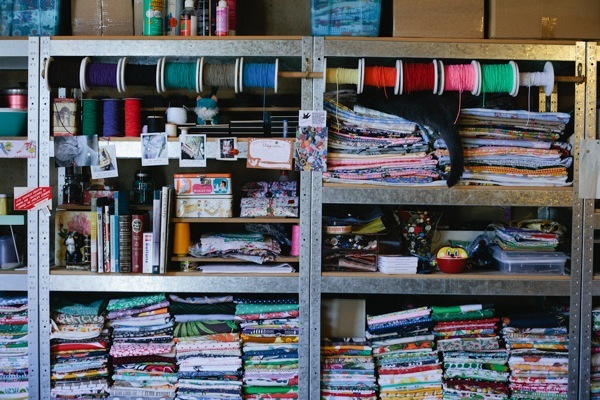 Ooooh lots of fabric, love to see where the magic happens – thanks for the peep into your studio! Lovely studio! So bright and colourfull! Looking forward to Melbourne F/K cant wait. What a wonderful creative space to escape to! Hallo from Athens Greece ! Everything you ve come into your lovely shop is wonderful ! It s a shame I cannot visit you in person. Congratulations ! Keep on making your dreams true ! OMG a love the cat in the shelf !